For many years, Apostle harbored those same myths and fears about her own role in the high-risk neighborhood of Central Park. Ward remembers a day when she was in her upstairs prayer room and she saw one of the “corner boys,” youth who sold drugs on the street, get shot. "I was terrified, and I broke the 'code' of not getting involved by calling the police," she recalls. "When they arrived, I ran down the stairs to talk to them. On the way, I ran into my husband, who was distraught with me for sticking my neck out. So I went back upstairs. And then, of course, the neighborhood went on as it always had, with filth, loud music, prostitution and drugs." Fast forward several months, and Apostle was confronted with the same choice, once again. I came home from the grocery store and found yellow tape marking off my house,” she remembers. “A teen had been killed in a drive-by shooting, right on my curb. This time I said, ‘not in this yard, not in this neighborhood.’” Apostle recalled the block parties her neighborhood organized when she was a child, complete with races and cake walks – activities that made residents feel connected. That’s what was needed again, she decided. The challenge: Every resident on the block had to agree to close down the street. And there were two who were the most difficult to win over. One of them was her own husband, who she won over with a pink negligee, pillow talk ̶ and a lot of prayer. The other was the gang leader; she walked right up to his front porch and asked for his cooperation ̶ along with no alcohol and no violence. Lo and behold, she got it. In fact, at the block party, the gang members who lived on the street contributed to the costs, and came out and played with their little sisters. 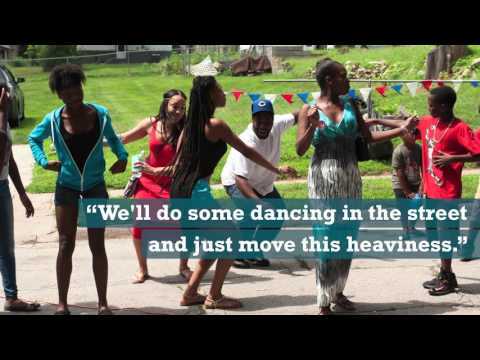 Twenty years later, the block party is still an annual tradition, attracting more than 800 people from all over Omaha. The neighborhood is considered an area of truce, residents talk in the street, and everyone chips in to clean up trash. The neighborhood association has re-established itself as well. Today, Apostle lives in a nearby senior-housing development. But she is far from relaxing in a rocking chair. She is currently president of the Central Park Neighborhood Association, president of the 4WardLead Title 1 Community Development Corp. (the nonprofit that occupies her former home) and member of the NeighborWorks Home Solutions board of directors. Her tips for others who follow in her footsteps? Start with your own home. Lead by example. Pick up the trash, bake cookies for the neighbors, take muffins to bus stops for kids going to school without breakfast. It will be infectious. Meet Apostle Vanessa Ward, one of seven winners of our 2015 Dorothy Richardson Resident Leadership Award, who helped reinvent her neighborhood in Nebraska and create a sense of community and goodwill with an annual block party.